Game of Thrones fans can now get this Stark Direwolf Handbag. This handbag is made from black PU and has the look you can see on many of the outfits of the character on Game of Thrones. On the front of the bag, you can find the direwolf that we all know from the House Stark logo. 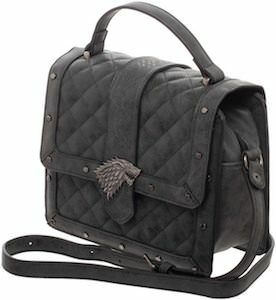 And this Game of Thrones bag has a nice handle on the top and adjustable and removable shoulder strap so that it is versatile and super handy to take. A cool bag like this is just nice to have and as it is not to obviously Game of Thrones this bag can be your daily bag for when you are out and about.